Car accidents in Florida, unfortunately, happen all too often—and they can tear lives apart. But in many cases, it’s not the moment the crash happens that those involved suffer the most, it’s days, weeks, even years after. In some circumstances, compensation from insurance claims sometimes seems low, even non-existent, or the injured party simply doesn’t fully recover from his or her injuries, all of which is unfair and devastating for injury victims and their families. Thankfully, there are those attorneys who are willing to fight for these victims like Gary S. Lesser of Lesser, Lesser, Landy & Smith, who is a champion of this cause. He is the managing partner of the renowned West Palm Beach-based firm, which just celebrated its 90th anniversary. Lesser has been running the firm for over 26 years, and his significant expertise of handling personal injury cases has guided numerous clients with car accident, medical malpractice, and defective product cases through every step of the medical, legal, and financial recovery process. What makes Lesser especially dedicated to helping those injured in such accidents? Well, he went through one himself. As a 22-year-old law student at the University of Miami, Lesser suffered a horrific car accident that he walked away from with what he thought were minor injuries and a slight ache in his jaw. What first seemed like minor discomfort became a constant, excruciating pain, and over the course of 18 years, Lesser underwent five surgeries, including surgically breaking his upper and lower jaw bones and finally undergoing a bilateral jaw joint replacement with hardware. He notes that going through this prolonged pain made him even more sympathetic to his clients’ needs. But his service to others extends way more than personal injury law. Lesser, along with his partners Joe Landy and Mickey Smith—who unconditionally stood by him during his recovery—are known for their community involvement in both legal and charitable organizations such as the Florida Bar, the Palm Beach County Bar Association, the Jewish Federation of Palm Beach County, the Florida Atlantic University Foundation, the Economic Council of Palm Beach County, and many others. 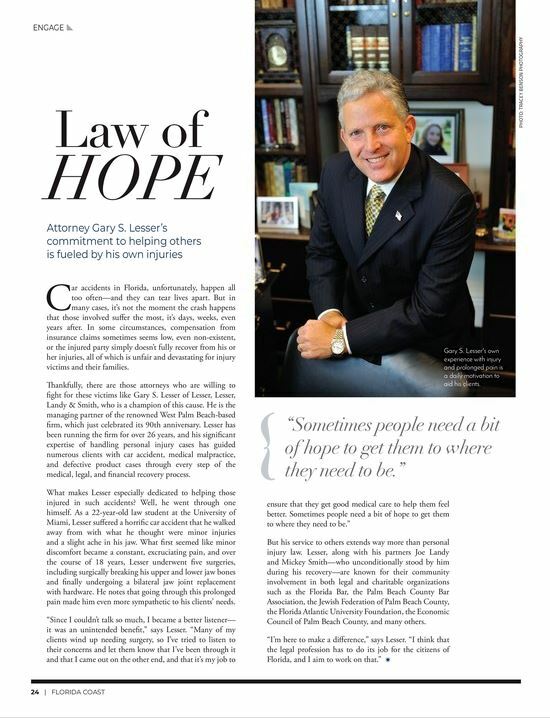 This article was published in the July/August issue of Florida Coast Magazine.